The old adage goes, "Before you learn to run, you learn to walk, and before you learn to walk, you learn to crawl." This maxim and the reasoning behind it dictate why we drop a small library's worth of colouring and alphabet-tracing books on a child as he/she walks into playschool. One needs to learn to colour within the lines before painting a masterpiece. The pre-set lines of a standard Marvel standalone film look something like this: We are introduced to a noble hero as played by a well-regarded yet moderately popular actor. We are also introduced to an utterly forgettable villain with a muddled motivation who is played by a respected actor well above the role's paygrade. We are introduced to a bunch of secondary, tertiary and ancillary characters who primarily exist to either endlessly quip or set up Easter eggs for upcoming projects. And finally, we have a finale where the good guy and bad guy go toe-to-toe with the same set of superpowers before the inevitable happy ending. Writers and directors are given endless freedom to express themselves within these strict parameters, and if that statement sounds paradoxical to you, um, we welcome you to Captain Marvel. In just over two hours, Marvel Studios introduce us to Brie Larson's Vers, a member of the Starforce of The Kree (a super-advanced alien race). The movie quickly gives you a lowdown on The Kree's endless war with the shape-shifting, goblin-like Skrulls. The story conjures up a scenario where The Kree and The Skrulls end up on earth in search of a mysterious artefact. Soon enough, Vers teams up with S.H.I.E.L.D agent Nick Fury (Samuel L Jackson), and the duo goes in search of this artefact. But little does she know that the search for this object will reveal to her more about herself than she ever expected. Insert quips, jokes, fights and resolutions, and we have yet another competently coloured page on the Marvel colouring book. But there is a strong reason that colouring booking are designed mostly for children and not for adults. As one grows up, one is expected to learn from the colouring books and training wheels of their youth and subsequently evolve into expressing themselves independent of those limiting barriers. At movie 21 (if these were years, this franchise would be old enough to drink, vote, and vote while drunk) in their ever-expanding cinematic universe Marvel seem to have regressed to the storytelling norms of their cinematic offerings from a decade ago. 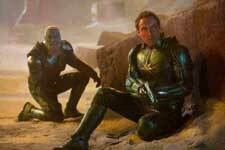 While their previous projects such as Black Panther, Thor: Ragnarok and Avengers: Infinity War were busy breaking racial, comedic and cinematic walls left, right and centre, Captain Marvel seems to lack the ambition to even try to aspire for something greater than being a passable movie-going experience. We say this with the self-awareness that our redundant plot description might have miffed quite a few readers off already. That was just to illustrate our frustration with watching an identical film play out before our eyes for the ninth time in the same shared universe. With nothing fresh in terms of an engaging story coming our way, we were forced to look towards the characters and their specific arcs to inspire some excitement towards this multimillion-dollar cinematic extravaganza. Sadly, the characters too seem all too been there, done that. Captain Marvel / Vers / Carol Danvers is the embodiment of everything good in the world, and that in itself makes her character instantly unrelatable. With her invincible self having an endless pool of power to draw from, there is little in terms of tension in the narrative. 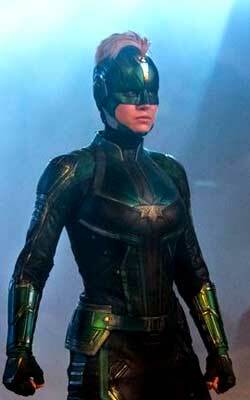 The woman donning the supersuit, Brie Larson, is indeed a talented actress, but she is no attention-grabbing superheroine (in this movie, at least). The scenes she shares with anyone not named Nick Fury have her come off as wooden and an actress acting like what she thinks is a strong, fierce and independent woman. And before anyone accuses us of being sexist, our reverence for Furiosa, our giddy joy at watching Wonder Woman walk across a battlefield, and having our collective minds smashed to smithereens after experiencing the all-female-led Annihilation make for some strong retorts. And therein lay Captain Marvel's problems - while the aforementioned films went outside their pre-set boundaries by incorporating some combination of inventive and pulse-pounding action, larger-than-life characters and intelligent philosophical commentary on the state of humanity and the world it inhabits, the latest entry into the MCU plays it safe by making it a run-of-the-mill superhero story with a feminist thread strung across it. With the thread's most powerful and affirming sequence being spoiled for the audience by the trailer itself, the film hopes the goodwill created for it by the previous entries into this beloved franchise and its adherence to formula can keep its head above water. Truth be told, the movie's unabashed reliance on the tried and tested works for it in spurts. While Nick Fury has no discernible character traits, he is gobs of fun to watch simply powered off the charisma Jackson brings to the role. While we dare our readers to recollect the name of the primary bad guy of the film from memory alone, Jude Law, too, remains fun to watch. And while her role fleets away with little in terms of lasting impact, Annette Benning's presence adds a regal touch to the film, more of which it could have done with. More of stuff the movie could have done with include integrating the inventive production design into its camerawork and editing. While the '90s are accurately brought to life with some choice establishments getting screen time and geometric cars being the talk of the town, the movie's flat camera movements and hyper-edited action blocks make for serviceable segments of film devoid of emotion. Copy and paste what we said about the visual presentation to the score as well, as repeating ourselves yet again might make some of you hurl a brick through your screens. Now that we've convinced you to keep that brick firmly in your hand, kindly let us finish our long-winded essay about a long-winded movie. Gordon Ramsay or Jamie Oliver write cookbooks to inspire amateur cooks like you and me. They, in themselves, don't need those books as their job requires them to conjure up delicacies from thin air or employs them to add their signature twists to pre-existing classics. If Gordon Ramsay and you followed the same recipe sheet and made the same dish to the same specifications, his final product would be no different than yours. In that case, why would you be compelled to drop your hard-earned money on something that can be created with minimal imagination or something that has been done better already? An empty canvas was there for the taking and what we got on it was a drawing of two hills, a river flowing alongside it and a sun rising behind them. As safe as it gets. And now we wait for the brick. You, sir, have a way with words. This review perfectly encapsulated the thoughts I came out with from the theater. This movie felt completely uninspired. I wasn't particularly irritated at any of the sequences, but I was just waiting for the film to end without actually ever feeling bored. The film had absolutely no emotional resonance. Every trope and set piece is something you've seen a million times before in multiple languages. If anything, this movie is proof that Disney is somehow buying out reviewers. I was sceptical when other weak movies such as Ragnarok and Homecoming received high scores, but this movie was conclusive proof. Just to clarify, the movie's controversy had nothing to do with my perception of this movie. It wasn't a good movie, period. TJ, I really hope you've seen Alita! I loved the movie to bits. Rosa Salazar literally poured life into a cyborg. She is the heart and soul of the film, and makes you empathise with her character all through the film. The action set pieces were fantastic, and the camera didn't create any action where there was none (i.e., no shaky cam). I felt weird loving the movie so much, given that it was basically part one of a franchise without a complete story and the movie itself was flawed in terms of pacing - it had an episodic feel to it, expected as it was due to the source material. I didn't quite understand why I liked it the first time I saw it, so I went back another three times to dig in and absorb it. The would building is fantastic, and the conflict and danger seem imminent compared to Captain Marvel's OP character. The cinematography, the steady build-up of stakes, and the time spent on character development really help you invest in the movie. The SciFi element also helped. It's a shame that this labor of love might not get a sequel due to its box office performance, but I'd really recommend anyone watching this to give it a shot. I, for one, have now started reading the manga just to see what happens. This, like Wonder Woman and Sarah Connor, is the badass female characters we need and can invest in. No virtue signaling or pushing a so-called agenda down our throats, just unadulterated action. Exactly my sentiments, TCMG. It is just an uninspired movie. I remember a joke Honest Trailers made about the Ghostbusters remake. It went something like "this movie shows that girls can make middle of the road, cash grabs just as well as the boys" And that is exactly what this movie is. I wouldn't go as far as to say critics were paid off or Disney/Marvel are trying to capitalize on a divided world but it is what it is. It is safe bet filmmaking going off the success of a franchise and its inbuilt fanbase. I just want to see them try harder. I did watch Alita. As you mentioned the pacing issues of the first half really pulled me out of it. It felt like too much too soon and would have worked better with a slicker script. The action was indeed amazing and they make the world very neat and presentable. If only, the storytelling was better. But that film didn't have the internet zeitgeist powering it so it was overly reliant on the Chinese box office to be profitable. Glad to get a laugh out of you Shiva. fullhyd.com has 700,000+ monthly visits. Tell Hyderabad what you feel about Captain Marvel!